On November 10 environmental advocates and concerned citizens will held a press conference at College Street and North Frontage Road calling for a revision of the development of Route 34 plan. 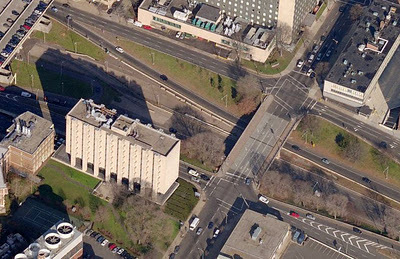 The New Haven Environmental Justice Network and the Yale Student Environmental Coalition are concerned the plan as proposed will do little to address environmental and health hazards – including respiratory disease, asthma, and other health impacts – related to Route 34 traffic. The groups, which will be present with signs and banners, chose a rush hour conference to underline the impact traffic has on this area. The current development plan expands road surface to accommodate commuters and support new development of office space and parking garages. The predicted increase in traffic will lead to more dangerous streets and also worsen already environmentally poor air quality standards. Vehicles on Route 34 annually emit over 34.6 tons of hydrocarbons, 13,548 tons of carbon monoxide, and 29.8 tons of carbon dioxide (from study in 2000). Vehicle use is presently the largest contributor to the state’s air pollution problem. Vehicle emissions are believed to present the greatest health risk to Connecticut residents include ozone, particulate matter, acetaldehyde (intensifies asthma), acrolein, benzene (carcinogen, eye and respiratory tract irritant), 1,3-butadiene (neurological effects), formaldehyde, and diesel exhaust. Fine particulate matter (PM): Studies have linked particle pollution exposure to a variety of health problems, including increased respiratory symptoms, such as irritation of the airways, coughing, or difficulty breathing; aggravated asthma; decreased lung function; and development of chronic bronchitis, etc. Ozone: Exposure to ozone can aggravate chronic lung diseases, reduce the immune system’s ability to fight off infections in the respiratory system, and aggravate heart disease. Asthma: About 9 percent of Connecticut’s youth have asthma. Inhalation of vehicle emissions is harmful to asthmatics. It can affect their lung function and may promote allergic reactions and airway constriction. New Haven has the highest asthma emergency room admissions in Connecticut. 18% of New Haven’s school children have asthma. It is imperative that development both supports economic development and human well being. Projects that focus disproportionately on developers’ interests generally fail to serve the community well, create significant hidden health costs, and can limit other long- term growth. The New Haven Environmental Justice Network and the Yale Student Environmental Coalition, call for the City to amend the Route 34 plan to better support alternative transportation, significant pollution decreases, and create and environment welcoming to walking and biking. A human health impact study needs to be completed for Downtown Crossing, both for Phase One and full build-out to fully understand the hidden environmental and health costs of this project. For some background 0n community efforts to rethink and improve the Downtown Crossing project, click here. The sewage treatment plant in the Eastshore section of New Haven — operated by the Greater New Haven Water Pollution Control Authority, a regional utility – currently incinerates sludge trucked in from around the state causing the release of heavy metals, radioactivity, sulfuric acid, dioxins, and other hazardous air pollutants as well as releasing these substances into the harbor. We are working for environmental protections and improvements to the GNHWPCA’s operations. The sludge incinerator in West Haven, which was re-started in 2011 after a period of dormancy, also adds to the toxic burden in the harbor area. We are currently advocating for the enactment of an environmental justice ordinance at the municipal level to bring greater transparency to the permitting process of environmental justice hazards. By enhancing community notification and public participation protocols for new polluting facilities seeking to relocate in our neighborhoods, this ordinance would be a strong complement to the landmark statewide 2009 environmental justice law. Description: Deregulation of state utilities has made it possible for green-energy providers to enter the Connecticut market. We hope to encourage this by educating New Haven residents about alternative energy and creating a demand for cleaner energy. Goal: To encourage consideration of EJ issues by the city, CCEJ wants to put EJ conscious people near the ears of city government; these people can help CCEJ learn what the city plans to do on issues related to urban environment. Description: EJ conscious people can make a differnce by joining the City of New Haven’s environmental advisory council, the zoning commission, or the planning board. The environmental advisory council gives advice only and has no decision-making power. However, it can raise awareness regarding the EJ implications of various proposals and help alert CCEJ to potential issues of interest. We have proposed an expansion of this board to include more community representation. The zoning and planning boards are both quite powerful and EJ supporters on these boards could give us direct influence on city development. Progress: Two members of NHEJN have been appointed to the environmental advisory council (Lynne Bonnet and John Dixon), and one of our members was appointed to the zoning commission (Lee Cruz). NHEJN’s Goal: To limit the air pollution in New Haven by preventing an increase in power generation (whether via the opening of new facilities or the expansion of existing ones) and by encouraging facilities to stop using #6 fuel oil. The CT Department of Public Health reports that New Haven had the highest hospitalization rate for asthma in the state during 2008. Coincidently, the state’s second largest sludge-burning incinerator is located in New Haven with negotiations afoot to have it burn sludge from 13 surrounding towns, increasing the environmental pollution burden for residents of the city. Fine particulate emissions are the highest in the state in New Haven, making that area out of compliance with federal environmental regulations for particulate levels as well as being out of compliance with federal ozone standards (as is the rest of Connecticut). CCEJ and New Haven Environmental Justice believe the city’s heightened asthma rates are tied to incineration and other sources of toxic air pollution. CCEJ has worked to educate the community on means to control asthma episodes and prevent its triggers in the home through a local Asthma Speakers Bureau. A new volunteer coordinator will revamp the ASB sometime in 2009. New Haven members interested to help contribute to ASB efforts or learn more about fighting asthma may join the NHEJN Asthma Council; please contact John Dixon through our Google Groups page to learn more. 4) a commitment by the GNHWPCA to support innovative, environmentally friendly technologies in its operations. NHEJN’s goals of ensuring majority representation to the most heavily impacted community (New Haven) and securing a commitment to a reduction and eventual elimination of sludge incineration are not met in the current proposal. A compromise in the form of super majority vote required for new service agreements and constraints on the process of adding municipalities to the region in the future may address these concerns. We remain strongly committed to the phase out of all sludge incineration and to the implementation of point-source control of pollutants. NHEJN believes that regionalization can be used to meet environmental justice goals, and we look forward to working in the future with the City and the Regionalized Authority to see these goals come to fruition.